Spring weather is starting early for us this year. We’ve already had days in the 70’s and 80’s which is actually closer to summer type weather! 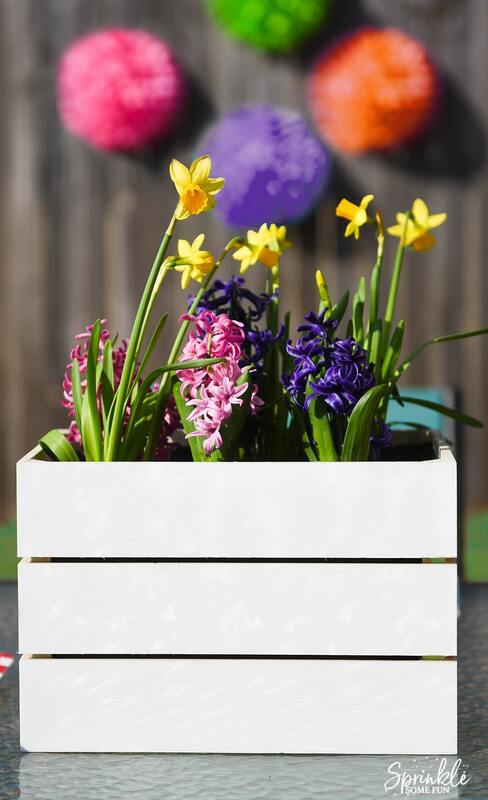 We are always excited for spring because that means we will be spending more time outdoors. I love watching and playing with my kids outside. For us, spring is also birthday time! All three of my girls have spring birthdays and we are looking forward to all the celebrating. The girls and I went to Walmart the other day and I asked them to start picking out what they wanted for their parties. We were inspired by all the bright colors of party decor they had! This Bright Floral Spring Birthday Party is bursting with color and floral touches! 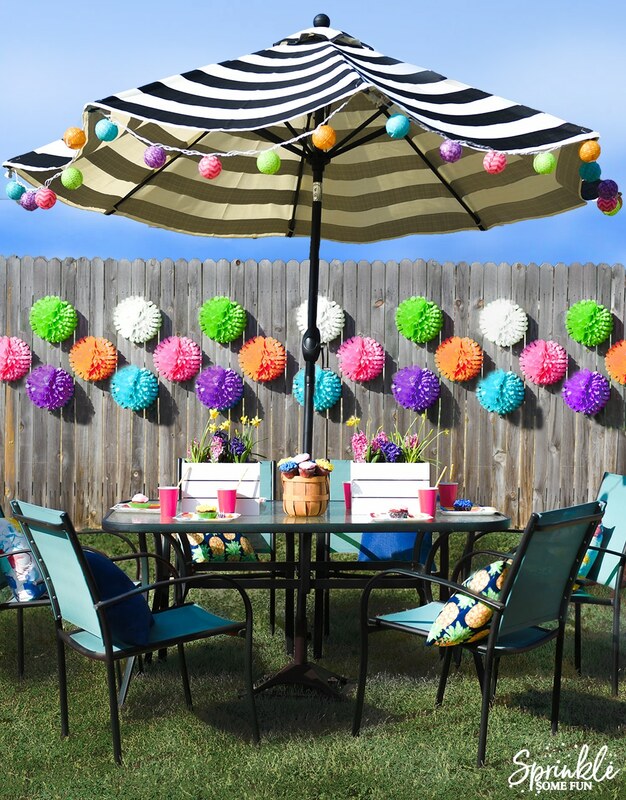 A mix of outdoor decorations and bright party supplies is a great way to celebrate outdoors. A Bright Floral Spring Birthday Party would also be great for Mother’s day or any party where you need a feminine touch. While at Walmart we found beautiful outdoor pillows and this black and cream outdoor umbrella. I fell in love with this umbrella and decided it was time to update the one we had for 11 years. It worked out perfectly for this party and ended up being my favorite thing to tie it all together! 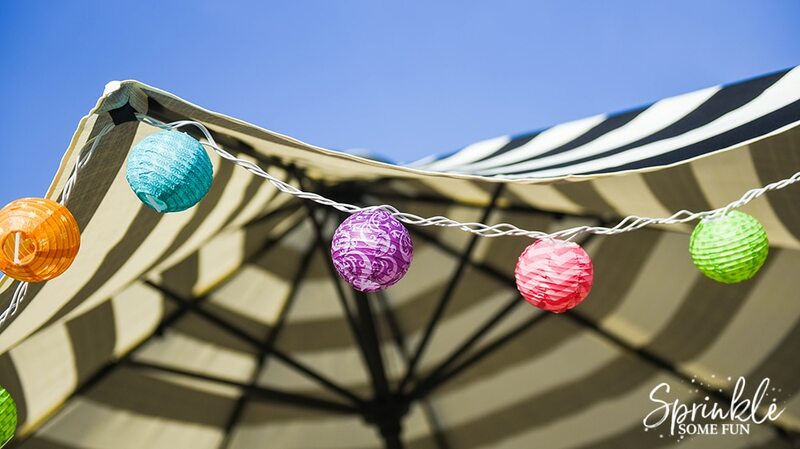 What’s great about this umbrella is that it tilts and also has velcro to hang up party lights. 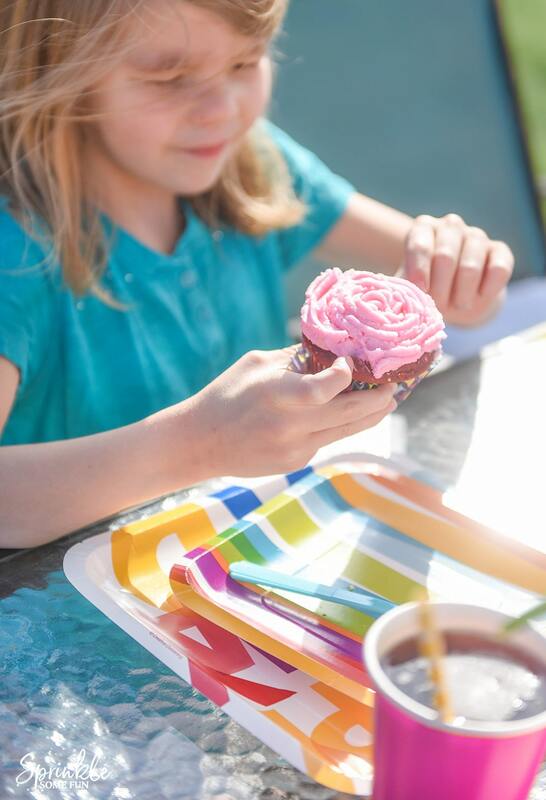 Walmart has a great selection of party supplies and these paper plates were my favorite! They had so many bright colors that would match any party theme. Walmart also has a wide array of character themed birthday supplies too. My 6 year old was loving all the Disney themed party supplies and my three year old boy loved the Paw Patrol supplies they had. I will definitely be heading back to Walmart for our next birthday party. These little wooden boxes were found in the arts and crafts section of Walmart right next to the party supplies. I felt they would be perfect as planters on the table. We stapled some garden fabric to the inside and filled it up with potting soil. Then we planted hyacinths and daffodils! So springy and fun!!! I always try to include things in my parties that we will enjoy well after the party… and these were just perfect! I loved how well the party supplies matched the flowers right down to the yellow dotted paper straws! My daughter baked up some red velvet cupcakes and we decorated them in pink roses, yellow zinnias and purple hyacinth. Then we also had a basket of them on the table. You can see the tutorial for Cupcake Bouquet Basket here. If you are not into cake decorating then Walmart also has a wonderful selection of cakes and cupcakes! In fact, even though I make cakes all the time I will use Walmart cakes when I am in a rush. It’s so much easier and it’s one less thing to worry about. Want to try one of their cupcakes for free? 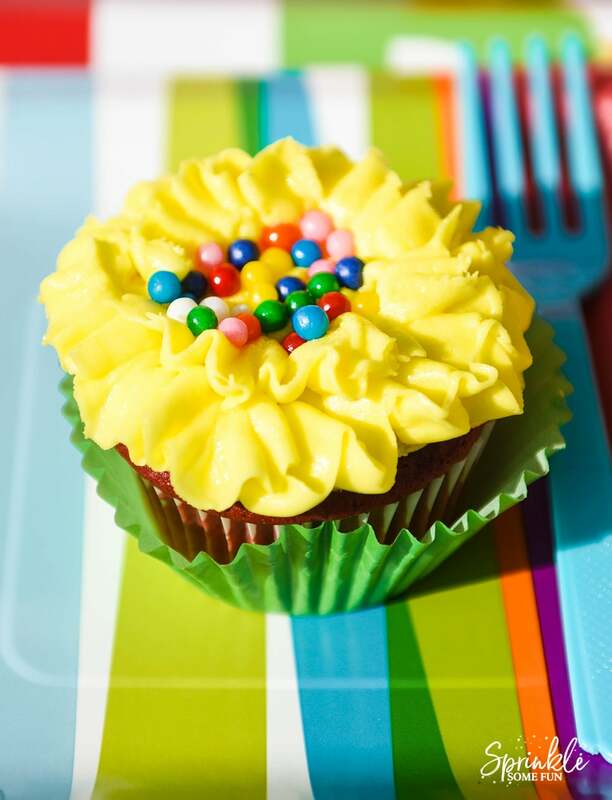 All you need to do is visit your local Walmart Supercenter on March 12, 2017 for a free cupcake! 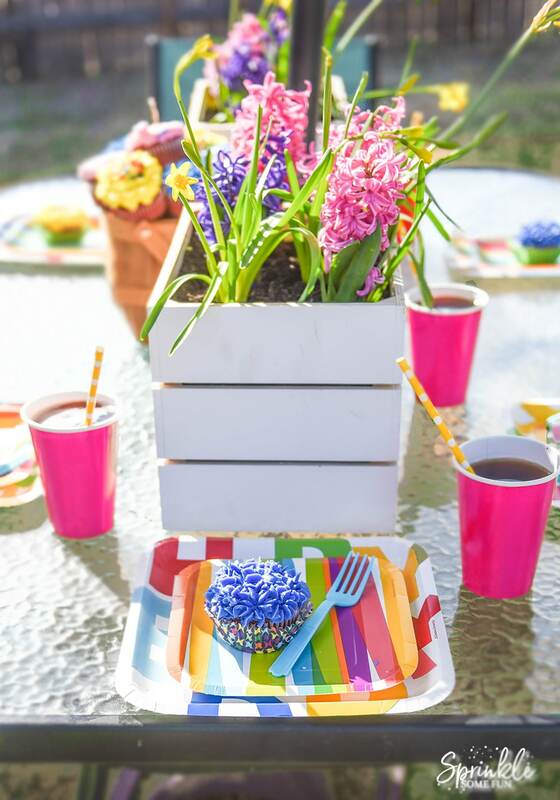 We loved our Bright Floral Spring Birthday Party! I am so glad that Walmart has everything needed for birthdays, including food, party supplies, decorations, gifts, toys, and cake. It’s nice that we can find everything all in one place. Do you have any spring birthdays coming up? Be sure to stop by Walmart for all your party supply needs!